Definition at line 66 of file PathDiagnostic.h. Only runs visitors, no output generated. Used for HTML, SARIF, and text output. Used for plist output, used for "arrows" generation. Definition at line 116 of file PathDiagnostic.h. Definition at line 208 of file PathDiagnostic.cpp. Definition at line 460 of file PathDiagnostic.cpp. Definition at line 127 of file PathDiagnostic.h. Definition at line 214 of file PathDiagnostic.cpp. 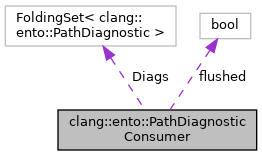 References clang::ento::PathDiagnosticLocation::asLocation(), comparePath(), clang::FullSourceLoc::getExpansionLoc(), clang::SourceManager::getExpansionLoc(), clang::SourceManager::getFileID(), clang::ento::PathDiagnosticPiece::getLocation(), clang::ento::PathDiagnosticPiece::getRanges(), clang::SourceLocation::isFileID(), clang::FileID::isInvalid(), and X. Return true if the PathDiagnosticConsumer supports individual PathDiagnostics that span multiple files. Definition at line 132 of file PathDiagnostic.h. Definition at line 128 of file PathDiagnostic.h. Definition at line 136 of file PathDiagnostic.h. Definition at line 135 of file PathDiagnostic.h.